We started our visit to Tenuta delle Terre Nere in the winery office, and met our host Marco Ciancio. The first thing that caught my eye in the office was a large geological relief map of the Etna region. I wanted one, but soon realised that even if I could find one to buy, there was no way to get it home intact on the plane and so abandoned the idea. Unlike most images here, if you click on it you can see an enlarged version, but sadly there is still not enough detail to read it properly. The town of Randazzo, and Tenuta delle Terre Nere, lie roughly to the North of Etna’s peak, and must be close to the edge of the orange bit at the top of the map. We were briefly introduced to Marco de Grazia, the founder of Terre Nere, who had popped into the office briefly despite not feeling well. He explained his vision of how Etna could rival Burgundy in terms of quality wines showing distinct terroir characteristics. On the face of it, it certainly seemed possible. 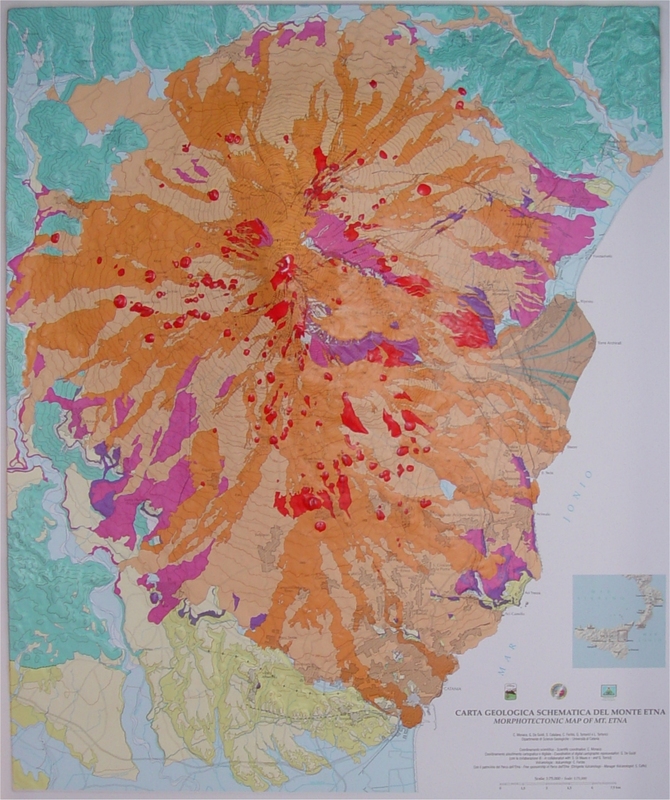 The colours on the map indicate geological variations, and superimposed on that there are large topological variations and height differences. The question remaining in my mind is whether Nerello Mascalese, the local standard bearer grape, is up to the job carried out by Pinot Noir in Burgundy. But even if Etna wine does not reach the dizzy heights of Burgundy, we can certainly all have a lot of fun discovering Etna’s potential. Before long we were in Marco’s 4×4, heading out to Terre Nere’s various contrade, a term which in wine law is now used to refer to officially defined vineyards areas. Terre Nere’s vineyards are laid out in a band along Etna’s Northern flank between Solicchiata and Randazzo, at heights between 400 and 900m. We started at the relatively low Calderara Sottana, with the prephylloxera vineyard, and then drove up to the higher contrade of Santo Spirito, Guardiola and Feudo di Mezzo. The differences between these vineyards were obvious even to the untrained eye. They were not the famed Burgundian terroir differences that depend on which side of the track, or exactly how far up a gentle slope, you are. The soils were clearly different in texture, and the altitude differences huge. 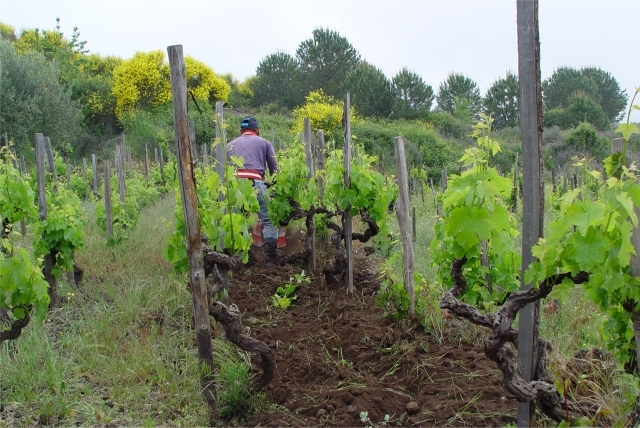 The image above shows rotovating in progress between old Nerello Mascalese albarello vines, in Guardiola I believe. Then back for a quick scamper through the winery. We paused to taste barrel samples from last year’s vintage, which was to be bottled in 2015. I am not sure how meaningful tasting notes are at this early stage in the maturing process, but they were already attractive wines and showing clear differences, so some brief impressions are given below. The wines are all Etna Rosso DOC, and would retail for around £28 in the UK, or £50 for the Prephylloxera. Cellar door prices were about the same numbers, but in Euros rather than Pounds.